224 • March 2019 • S I G N & D I G I T A L G R A P H I C S This month's interview is with Matt Charboneau. Since 1985, Matt Charboneau has owned and operated Charboneau Design and Consulting. He is a consultant and designer for monument, channel let- ter and pylon sign projects. He is also the author of, "The Pre-Sale Sign Survey Field Guide," available on his website: www. CharboneauSigns.com or by emailing him at Matt@CharboneauSigns.com. 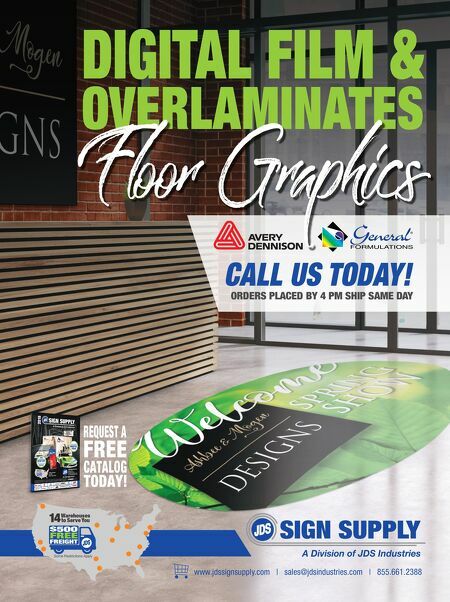 What path brought you to where you are in the sign industry? For me, it was a desire to provide a very needed, specialized service for the sign industry—and design had always been my sweet spot. I mean, it was the part of my day I loved the most, so over the years I guess I kind of groomed myself to focus and spe- cialize more and more on monument sign design, and all that was involved with providing that service to sign companies. I marketed my services to sign shops who had those occasional opportunities to bid on a large monument sign project, but they had nobody on staff with the knowledge or experience to handle the conceptual drawings, design, estimating, fab and install files. If you were 18 and thinking about becoming a designer, how would you approach your education? Step one, day one would be spending a full week bending chan- nel letters by hand so that a deep appreciation and understand- ing of the importance of stroke width could be pounded into my tiny brain. This would hopefully also include learning all about the router files needed for production and why exactingly accurate design files are so critical for production. This would provide a unique understanding as to what is needed for routing and cut- ting, and which details don't help the process. Step two would be two weeks in fabrication—stick built cabi- net fabrication with all that is included in saddle making, interior bracing, support attachments and the absolute necessity of plan- ning out where the access panels must go so that the sign can be installed and serviced. This would be so very valuable in estab- lishing the importance of making sure your sign design is actually buildable by the fabricators. Lastly, get some formal classroom training on the lost art of proper dimensioning. 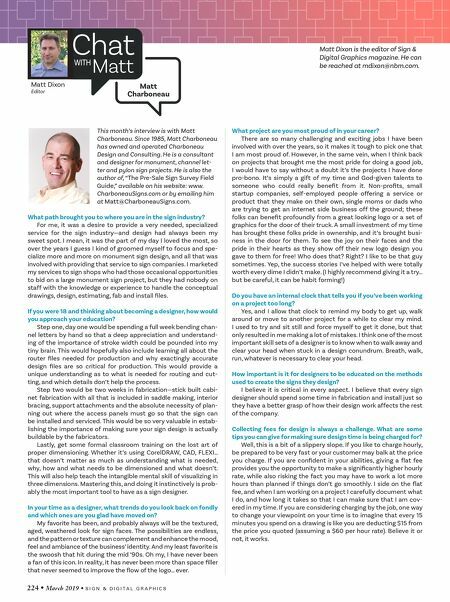 Whether it's using CorelDRAW, CAD, FLEXI… that doesn't matter as much as understanding what is needed, why, how and what needs to be dimensioned and what doesn't. This will also help teach the intangible mental skill of visualizing in three dimensions. Mastering this, and doing it instinctively is prob- ably the most important tool to have as a sign designer. In your time as a designer, what trends do you look back on fondly and which ones are you glad have moved on? My favorite has been, and probably always will be the textured, aged, weathered look for sign faces. The possibilities are endless, and the pattern or texture can complement and enhance the mood, feel and ambiance of the business' identity. And my least favorite is the swoosh that hit during the mid '90s. Oh my, I have never been a fan of this icon. In reality, it has never been more than space filler that never seemed to improve the flow of the logo… ever. What project are you most proud of in your career? There are so many challenging and exciting jobs I have been involved with over the years, so it makes it tough to pick one that I am most proud of. However, in the same vein, when I think back on projects that brought me the most pride for doing a good job, I would have to say without a doubt it's the projects I have done pro-bono. It's simply a gift of my time and God-given talents to someone who could really benefit from it. Non-profits, small startup companies, self-employed people offering a service or product that they make on their own, single moms or dads who are trying to get an internet side business off the ground; these folks can benefit profoundly from a great looking logo or a set of graphics for the door of their truck. A small investment of my time has brought these folks pride in ownership, and it's brought busi- ness in the door for them. To see the joy on their faces and the pride in their hearts as they show off their new logo design you gave to them for free! Who does that? Right? I like to be that guy sometimes. Yep, the success stories I've helped with were totally worth every dime I didn't make. (I highly recommend giving it a try… but be careful, it can be habit forming!) Do you have an internal clock that tells you if you've been working on a project too long? Yes, and I allow that clock to remind my body to get up, walk around or move to another project for a while to clear my mind. I used to try and sit still and force myself to get it done, but that only resulted in me making a lot of mistakes. I think one of the most important skill sets of a designer is to know when to walk away and clear your head when stuck in a design conundrum. Breath, walk, run, whatever is necessary to clear your head. How important is it for designers to be educated on the methods used to create the signs they design? I believe it is critical in every aspect. I believe that every sign designer should spend some time in fabrication and install just so they have a better grasp of how their design work affects the rest of the company. Collecting fees for design is always a challenge. What are some tips you can give for making sure design time is being charged for? Well, this is a bit of a slippery slope. If you like to charge hourly, be prepared to be very fast or your customer may balk at the price you charge. If you are confident in your abilities, giving a flat fee provides you the opportunity to make a significantly higher hourly rate, while also risking the fact you may have to work a lot more hours than planned if things don't go smoothly. I side on the flat fee, and when I am working on a project I carefully document what I do, and how long it takes so that I can make sure that I am cov- ered in my time. If you are considering charging by the job, one way to change your viewpoint on your time is to imagine that every 15 minutes you spend on a drawing is like you are deducting $15 from the price you quoted (assuming a $60 per hour rate). Believe it or not, it works. Matt Dixon Editor Matt Charboneau Matt Dixon is the editor of Sign & Digital Graphics magazine. He can be reached at mdixon@nbm.com.